More economically suited for some markets, Low Density PTFE thread seal tape compliments our line of premium Poly-Temp® tapes. Still made with virgin PTFE (Polytetrafluoroethylene), this tape remains flexible, is a thread sealant for all services, chemically inert, non-hardening, and withstands temperature ranges between -400° to 500°F (-240° to 260°C). Its homogeneous composition offers maximum protection against seizure and heat freeze, eases assembling and dismantling, and saves man hours. Well suited for steel and aluminum. 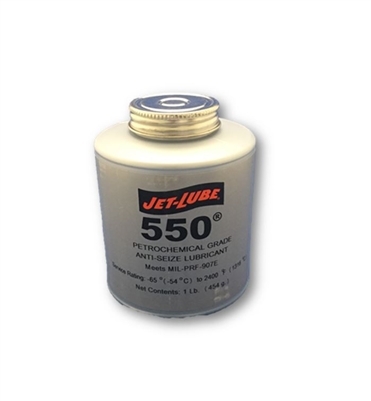 550 works equally well on stainless steel, cast iron, titanium, copper, brass, alloys, plastic, and gasket materials. 550 is an effective anti-seize on LPG and other gases. For sealing applications, use V-2®. For use in federally inspected meat and poultry plants or any application where incidental contact with food may occur. Use on conveyors, kitchen equipment, etc. Lead-free, non-hardening, non-toxic, opaque gray paste. Adheres readily to iron, stainless steel, aluminum, monel, plastics and synthetic rubber compounds. S'MOOTH™ is a general-purpose metal pipe thread sealant for industrial and residential use. This white paste has a smooth consistency and no grit.